Fujinon are pleased to announce their brand new 14 times magnification stabilised binocular at a highly attractive price. 100% waterproof with a high impact polycarbonate housing, the techno-stabi is recommended for use on boats and planes and has seven times the stabilsation freedom than any major competitor. 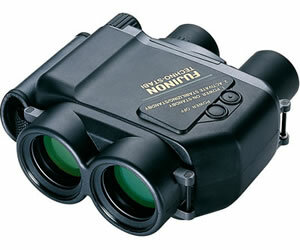 Now it is possible to hand hold a high magnification binocular in comfort for long periods whether it be for birdwatching, security or general use. From the company that invented gyro-stabilised binoculars - the new Techno-Stabi outperforms and out values the competition. Proven on the space shuttle, Fujinon brings image stabilisation down to earth. Dual piezo-vibration sensors linked to direct drive motors help you lock onto the subjects with rock steady images - even if both you and the subject are in motion.